This is one of the many problems faced by working mothers. Passengers could face long delays. You‘re faced with a very difficult choice there. They are faced with major financial problems. Organizers for the 2020 Tokyo Olympics on Thursday unveiled three final candidates for the games’ official mascot, passing the baton to the nation’s elementary school students — who will pick the winner in a vote starting Monday. 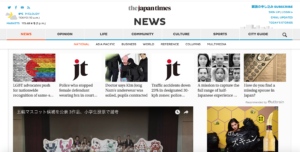 The final proposals have been short-listed from a total of 2,042 design submissions from the public, and were presented with help from 113 children during a ceremony at Kakezuka Elementary School in Tokyo’s Shibuya Ward. Each proposal is a set of two characters — one for the Olympic games and the other for the Paralympics. This story was short-listed for the Pulitzer Prize. His latest novel has been shortlisted for the Man Booker prize. All submissions must be received by 10 April. The films were chosen from 350 submissions. The first final candidate set has an Olympic character based on a futuristic vision of the world, and decorated with a traditional checkered pattern to embody Japan’s tradition and innovation. The Paralympic character is decorated with cherry blossom flowers and has superpowers. The second set features an Olympic character based on Japan’s lucky cat and inari fox — which also symbolizes luck — and a Paralympic character resembling a guardian dog often seen at shinto shrines. The third set of red and white characters with ribbons used as celebratory ornaments — a fox for the Olympics and a tanuki (raccoon dog) for the Paralympics — has been inspired by traditional fairy tales. She embodied good sportsmanship on the playing field. Arthur Ashe embodied the ideals of good sportsmanship. The spirit of hope is embodied in the character Anna. When we heard she’d got the job, we all went off for a celebratory drink. They spent decades collecting these colorful, Victorian-era ornaments. She subsequently chaired the executive board of the UN Children’s Fund. Would you like to chair tomorrow’s meeting? The competition will be judged by a panel of experts. She‘s deputy (head) of a large North London school. The main aim of the exhibition is to showcase British design. In the opening set, he showcased his own songs. Louis Armstrong’s mastery of the trumpet is legendary. Doi, who takes lessons at a swimming school and wants to become an athlete, added that he was looking forward to watching Olympic competitors — especially those representing his favorite sport — compete in his hometown. He said he felt responsible for choosing a winner that will become part of Japan’s legacy — as the mascots will be featured in various events and on licensed products related to the games. After vacation, she returned to work with renewed vigor. After a brief rest, she returned to the job with renewed vigour. The stadium was packed with cheering spectators. TV personality Shoko Nakagawa, another member of the screening committee, called the student vote “historic” given that mascots were not used in 1964. 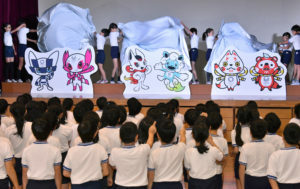 The mascots will be selected by school children for the first time in the games’ history. One vote will be allocated to each elementary school class taking part in the poll from Monday through Feb. 22. Schools must register to participate, and the organizers said that 4,150 schools were registered as of Thursday at noon. Students from Japanese schools outside Japan and from Japan’s international schools are also eligible to vote. The selection panel will announce the winner on Feb. 28 after a final review. The mascots’ names will be chosen based on feedback from creative professionals and will be announced next summer. We allocate each student a personal tutor. The committee allocates funds to universities. The government is allocating £10 million for health education. State funds will not be allocated to the program next year. We‘re carrying out/conducting a poll to find out what people think about abortion. The latest opinion poll puts the Democrats in the lead. A recent poll indicated that most people opposed the changes. According to a poll conducted last week, 75% of the public support the Prime Minister. Are you eligible for early retirement/maternity leave? Only people over 18 are eligible to vote. She will be eligible to compete in the next Winter Games. You have to be employed six months to be eligible for medical benefits.